On his way out to meet Laura and I the previous morning, Tom's Jeep experienced transmission failure driving north on I-15. He could no longer shift out of fourth gear rendering the Jeep not exactly incapacitated, but crippled. Starting from a dead stop was a slow process and top speed was limited. I probably would have turned around and gone home had it happened to me, but Tom checked the auto forums online and found he could make due for the weekend and deal with it when he got home. This meant that the more adventurous driving we had planned in Red Rock Canyon State Park would have to be put off for another time and we'd have to find tamer driving for today. Luckily (some might say otherwise) I had come prepared with a few weak offerings that had some interest to me and almost no one else on Earth. Ever the sport, Tom didn't complain once. This summit in the Rand Mountains is found in Wheelock's out-of-print desert guide. Zdon left it out of his expanded version, Desert Summits, because it lies on private property. With barely 100ft of prominence, it's surprising that Wheelock bothered with this one at all. It isn't particularly striking and it wasn't obvious where the summit was until we were nearly upon it. The main problem with this one is the Sydney ( spelling is indeed different than the peak) Quarry which lies southeast of the summit. A good dirt road leads to the quarry and base of the peak from the Randsburg-Mojave Rd (an excellent, high-speed dirt road), but is BLM-signed for Permit Required. This was something new - who needs a permit to drive on BLM lands? Arriving the previous evening, we ignored this for the moment and drove in on the road anyway. It leads directly to the quarry where we were met by a barking dog at the gate found there. Dogs mean people, so we didn't think it wise to stay there. Turning around was going to be another matter since we didn't have reverse gear working at the moment. The road had a slight uphill gradient on the way in, so Tom used this to coast backwards for almost a quarter mile before he could back it into a side junction - pretty skillful driving in the dark with only back-up lights and a strained neck from turning the head for so long. We ended up camped for the night at the junction with the Randsburg-Mojave Rd. Further reading of the signs there suggest the restrictions are to preserve desert tortoise habitat. We could live with that. In the morning we started the 2mi+ hike to the summit starting up the road. Before reaching the quarry we kept to the left at a junction with an old BLM road, giving the quarry a wide berth. We entered quarry property on its far western edge, going over a fence found there. The ground here had been bulldozed and rearranged in decades past, but there doesn't seem to have been much extracted from this part of the quarry. The peak itself, which we identified with the help of the GPSr, was untouched by bulldozer or pickaxe and an easy climb from any direction. It is the pointiest pile of rubble around, but still a pile of rubble. The main crest of the Rand Mountains lies just behind the summit. It would probably make a nice hike to continue northwest along the crest to Rand Mtn and Government Peak. Having already done those, I didn't suggest this longer option. Plus, I had other plans for occupying another portion of the day. We returned via much the same route, with a slight option staying outside the western edge of the quarry property for a short time until the terrain made going back through the fenceline more reasonable. We spent an hour and a half covering about 4.5mi. Not much to recommend this summit. 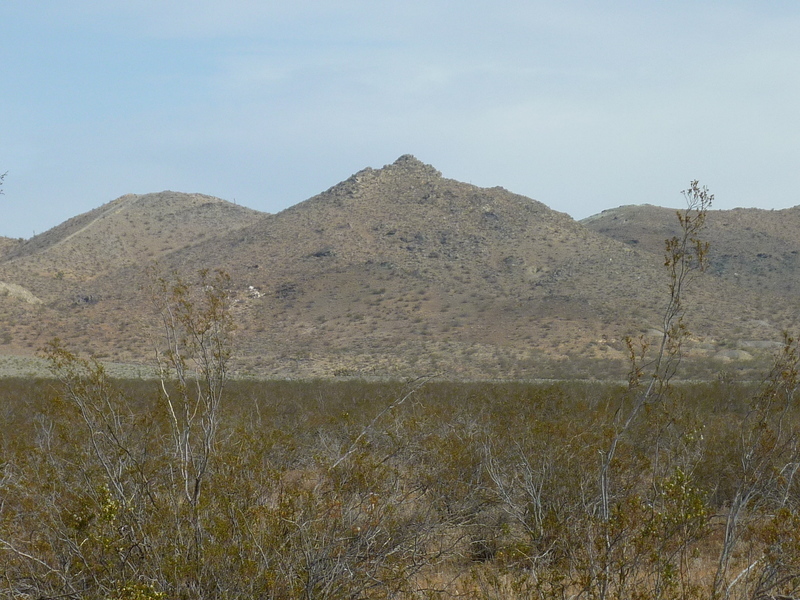 These summits are located in the southernmost part of the Sierra Nevada, just north of SR58 as it climbs from Mojave to Tehachapi Pass. Oddly, only Middle Knob is officially named on the topo maps. West and East Knobs are unofficial names that I got from Andy Smatko's ascent records and the primary reason they were on my radar. West Knob is the highest with more than 1,000ft of prominence and I had climbed this from Sand Canyon to the west several years ago. Though all three are on BLM land, access from the south isn't obvious as there is a checkerboard pattern of BLM and private land ownership. Driving on the almost forgotten Randsburg Cutoff Rd (good pavement, btw), we found a BLM road heading northwest towards our summits. I had identified this beforehand with the satellite views, but was happy to find it publicly accessible. Now if we could just manage to drive the Jeep up this steep road with only a single gear. A crippled Jeep proved more adequate than my low-clearance van and we managed to drive 2/3 of the distance and half the elevation gain between the pavement and the summits. The road begins tamely, climbing low-gradient slopes to the base of the mountains, then begins a harrowing climb on a very narrow road lined by near-cliffs. Finding one section particularly steep and loose, we backed down to park it just off the road at a small saddle, hoofing it from there. We spent 25min hiking the road to the crest and saddle between our two peaks. We turned right at a fork found here, following a less-used road towards East Knob. The west side of East Knob is a moderately steep open slope, an OHV test piece for King of the Hill bragging rights. We climbed to the top where pinyon trees blocked much of the views and made finding the highpoint a bit of a challenge. Using the GPSr as a guide, we picked a (very) small rock outcrop near the west end of the summit area as the highest. After returning to the saddle and continuing on the road to Middle Knob, the quiet was disturbed by a trio of motorcyclists running their machines up East Knob. A few made it look easy ("never hesitate" appears to be key) while one of them stalled about halfway up. We were just happy that they waited until after our own summit visit.